So many years into this blog, it’s super exciting to see something never seen before: Christina’s 1964 bathroom has 4-inch by 8.5-inch pink ceramic tiles, run vertically. That’s a double-sized tile compared to what we’ve seen in millions of other bathrooms, and like I said, I don’t think I’ve ever seen this in the wild before. Very cool — and a dreamy bathroom, too! 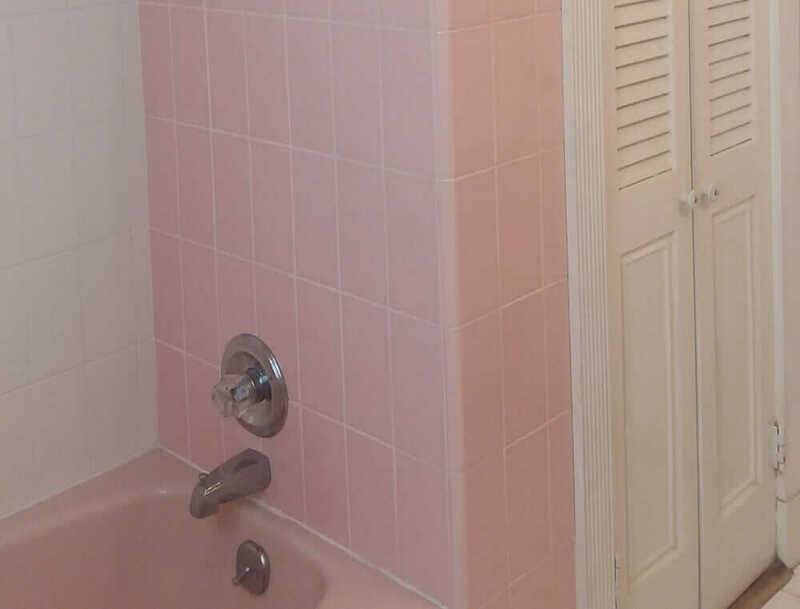 Hello, I just bought a mid century home with 2 colorful bathrooms. The green one is very much of the time, the type you regularly feature on your site (though still great). The pink one seems a bit different to me. 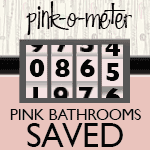 It has 4.25″ x 8.5″ tile run vertically from floor to ceiling on most of the walls. I’ve been haunting your site trying to find something like it, but not having much luck. 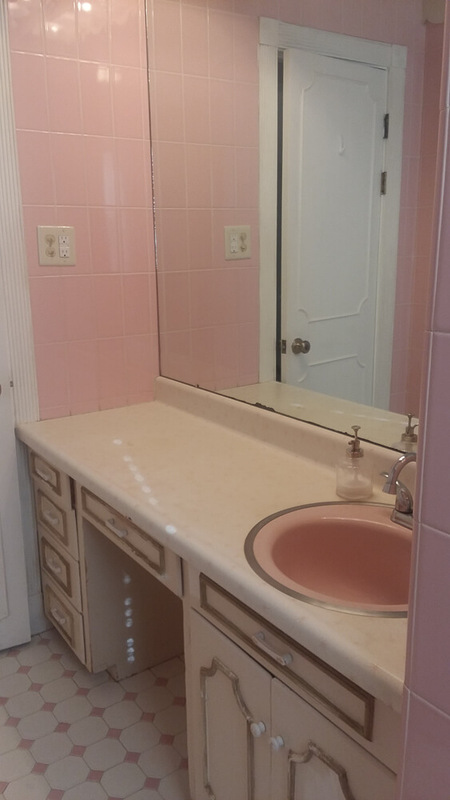 There’s a matching pink tub and sink and a pink starburst laminate countertop. And to top it off, scalloped wooden cornices over the shower and vanity. I just love the whole thing! I guess I’m mainly just curious whether the tile design is as odd as I think it is. And, of course, most people think I’m nuts for liking it at all, so it’s nice to share with someone I know will appreciate it. I wrote write back, excited. I pointed her to this story — the time I spotted 4 inch by 6 inch tiles in a nearby high school bathroom. But 8.5 inches? Send me photos, stat! I did see the story about the school bathroom. It actually made me double check the measurements of my own tile. Not the same size, but pretty close on color. My house has really only had two owners since it was built in 1964. They each owned it for nearly 30 years. Unfortunately, it was purchased as a flip after the second owner became too elderly to maintain it. But luckily they didn’t flip it too hard. 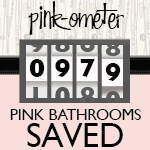 The bathrooms were barely touched at least. The biggest loss was probably the kitchen countertop, though they didn’t replace it with granite so I still consider myself lucky. The bathroom is still a work in progress since I’ve only owned the house for a couple of months. 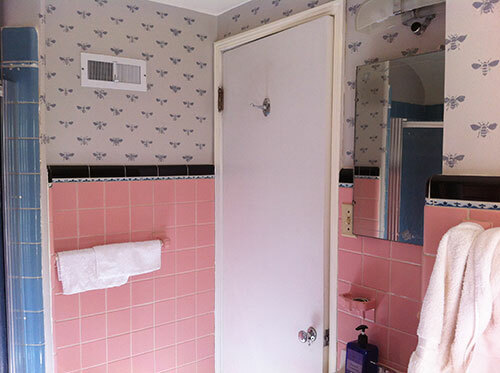 The toilet alcove was covered in a terrible 80s pink gingham wallpaper that I’m still in the process of removing. The original wallpaper is visible over the vanity. It has a metallic gold geometric pattern, which is just great. I’m trying to decide whether to mimic it with paint or try to customize new wallpaper. The vanity has definitely seen better days. It badly needs repainted, and I’m trying to decide on a color for that and the cornices. The starburst countertop is yellowed and stained, but I love it too much to replace it. Funny story — I first saw this place when they had an open house. The listing agent showed me around and was very apologetic about this bathroom. She even said she had told the owner they should have at least ripped out the vanity. I, of course, was horrified. 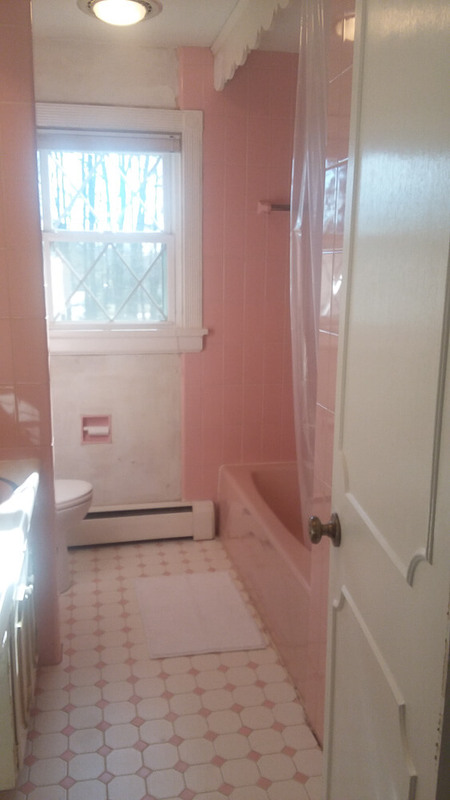 I love the whole house, but I think the deciding factor for actually buying it may have been to save this bathroom. That’s normal, right? Yes, Christina, here that “deciding factor” is not only normal, it makes you are hero of the day! You should be able to stencil the walls to replicate that fabulous wallpaper…. My brother works for Bradbury & Bradbury wallpapers (seen here often). I looked at your wallpaper sample, and it appears to be just one color of ink, so I know that means it would be relatively inexpensive to recreate (as authentic recreations go, but very expensive considering how little you need for a bathroom!). I don’t know if Bradbury would be willing to do it as a custom job, but they can probably refer you to someone. They handcraft the paper using silk-screening–and it’s certainly the way to go in a Victorian era retrorenovation. The world is full of historic homes and other buildings and museums that have used their services to recreate original paper designs. One thing I will say about this type of wallpaper is that I don’t think I would put it in a damp area because it is paper, and not really scrubbable or waterproof. I was toying with the idea of putting some behind glass for a backsplash in my kitchen, but still haven’t decided. Stenciling with paint may be your best option. I can’t see the wallpaper sample. Where is it?